Such was the provocative title under which Alexander Cockburn ran a recent column discussing my China/America article in The Week, a British-based news magazine which claims a total American print circulation of over 500,000. We’ll see whether anyone notices that column either. Cockburn’s question referred to my examination of the American mortality figures surrounding the heavily-promoted anti-pain drug Vioxx, released by Merck in 1999 and pulled from the market in 2004 after a published FDA study indicated it seemed to double the risk of heart attacks and strokes and had probably been responsible for at least tens of thousands of American deaths. I had noted that the major shifts in total American mortality bracketed by Vioxx’s introduction and recall—shifts which were concentrated in exactly those age-groups taking Vioxx and were due to the aforementioned heart attacks and strokes—may actually point to a total death-toll an order-of-magnitude greater than that initial scientific estimate. The lack of apparent public interest in these matters merely reflects the degree to which most Americans these days define their reality by what they see on the television or film screen, which also informs them what matters and what does not. Thus, the episodic foibles of a Lindsay Lohan or a Britney Spears carry enormous national importance because these are widely discussed on television, while the premature deaths of perhaps half a million American citizens from an aspirin-substitute does not. And nearly all our elected officials and other national leaders seem just as totally dominated by such television-produced reality. This is not a sign of a healthy society nor one likely to long survive in its current form. An interesting and disturbing historical analogy presents itself. During the 1980s, the late, unlamented Soviet Regime allocated a hugely disproportionate share of its financial resources to military spending, and as a result possessed the world’s largest and most powerful armed forces. Partly as a consequence, most Soviet citizens endured decades of economic stagnation, while even that vaunted military was bogged down in an unwinnable war against scattered Afghan Muslim guerillas. These factors eventually led to a fatal crisis of internal ideological legitimacy and popular support, only partially masked by the constant Happy News of the official media. There were many straws which helped break the back of the Soviet camel, but one of the greatest was the Chernobyl nuclear disaster, whose deadly impact was initially downplayed or even ignored by the dishonest Soviet media, and only became fully apparent when the national mortality figures were later examined. As ordinary Russians and Ukrainians gradually realized that tens of thousands had died from radiation-induced cancer but that their regime and its controlled media had covered up these facts, the strong popular reaction was a factor in the rise of Mikhail Gorbachev and his sweeping reformist agenda, an agenda which soon led to the complete collapse of the Soviet Regime. It is not impossible that a belated public discovery of 500,000 Vioxx-related deaths might constitute America’s own Chernobyl, but one with perhaps ten times the total death toll. My late friend Bill Odom, the three-star general who ran the National Security Agency for President Ronald Reagan, had spent his entire career as a Soviet specialist, and prior to his death we both concluded that the American mainstream media of the 2000s had become increasingly indistinguishable from the Soviet Pravda of the 1980s. Whether America itself can avoid the fate of its doomed Cold War counterpart still remains an open issue. One very heartening aspect of the response was the extent to which the positive reaction crossed political and ideological lines, very similar to the trans-ideological stance I had attempted in writing the piece. Just as today’s Democratic and Republican ruling political elites have increasingly merged into a corrupt One Party Regime, many individual critics both of the left and of the right have gradually discovered that they have much more in common with each other than might seem to be the case in the false reality created by FoxNews vs. MSNBC political mud-wrestling tournaments on television. Reaction elsewhere on the Right was also quite supportive, with John Derbyshire at Takimag.com tending to agree for his own reasons with my appraisal of China’s advantageous position compared to that of the U.S. Similarly, Steve Sailer highlighted the article, and the reaction among his generally rightwing commenters was mostly very favorable. Prominent libertarian and anti-globalization websites such as LewRockwell.com and GlobalResearch.ca also republished my article, distributing the ideas to much wider and more disparate readerships than are normally drawn to TAC’s own website, and these alternate distribution channels probably accounted for the majority of the blogsite comments and discussions, as well as my short television interview on Russia Today news. Explorations via Google also revealed that my piece was getting considerable favorable mention in even the more extreme ideological fringes of the Left and Right. Despite finding favor at the “extremes,” it also simultaneously received the most mainstream possible endorsement, being distributed with favorable comment by former U.S. Ambassador Chas Freeman, who had also served as co-chair of the U.S. China Policy Foundation and vice-chair of the Atlantic Council. Outside political circles, Michael J. Casey, Managing Editor and Columnist on Financial Markets for The Wall Street Journal, broadcast it out to his twitter feed and also posted it on his blogsite, notably including my graph of the relative economic performance of the Chinese and American economies over the last thirty years. After all, investors in financial markets prefer to make their business decisions based on reality rather than merely ideological propaganda. The only significant demurrals, explicit or implicit, seemed to come from might be called the “Establishment Right.” A very prominent conservative scholar who thought quite highly of my piece and passed it along to his friends later pointed me to a column by Rich Lowry, editor of National Review, which denounced “China Envy” and appeared a week or so after my own, and he suggested it had been intended as a rebuttal although the purported targets were mainstream liberal figures such the NYT’s Thomas Friedman and former SEIU leader Andy Stern. 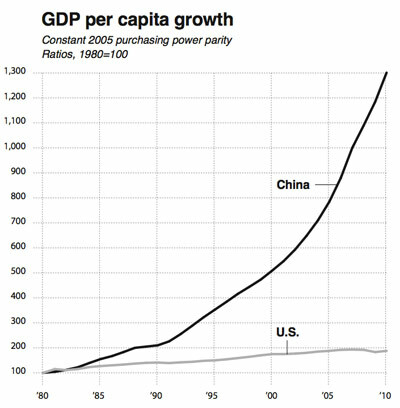 Meanwhile, a far more substantive and detailed critique of China’s strength appeared in the current NR print edition by policy analyst Reihan Salam, which argued that China’s economic growth rate was unsustainable. He also pointed as an analogy to the many prominent Western intellectuals who for decades had claimed that supposedly high USSR industrial growth rates were proof that the American system was hopelessly outmatched by its Cold War rival. While I agree that Salam’s USA/USSR parallel is an apt one, I would argue that the weight of the evidence today actually places America in latter slot, for a wide variety of different reasons. I have been through passport control in the USSR, which was very like the US today. In Houston for example the officials went through my camera photo by photo and examined all CDs I had with me. I arrived in Pekin a few years back, expecting something similar. The passport looker-atter took maybe twenty seconds to find my visa, returned my passport, and that was that. I looked for a customs-inspection operation. There–I am stone cold sober–was none. I got in a cab and went to my hotel. My first trip to “Red” China was in 1984. I have been there several times since then, and attest to its enormous economic and social strides there. Their progress over the past three decades is simply amazing. During Mao’s time, and for many years thereafter, it was simply obvious that the Chinese state was more oppressive than the US government. China is still an authoritarian state, but my visit last year makes me wonder whether it is still more authoritarian than the US. Seriously. As an old American, and formerly quite patriotic and anti-Communist, this is still difficult to comprehend. I have travelled the thousands of miles by railroad in China freely without providing identification. Identification for air travel was required, but security procedures were civilized. In fact, I was never harassed by authorities while travelling, quite unlike the US travel experience. We did have one run-in with the police, however. My sons and I were caught by a thunderstorm while walking one night, and the cops invited us to come inside their guardhouse to wait out the storm. WRT the “extractive elites”: both countries have them. I don’t have a statistically significant sample size, but I’ve met some of the state elites in both countries. My own anecdotal experience is that the Chinese elites have about a 20 IQ point advantage over their American counterparts. I hypothesize that the relative intelligence of the elites may have a bearing on relative performance. I can’t say that I was close enough to any of these elites to determine their relative virtuousness or viciousness. However, the simple fact is that Chinese state enterprises are buying African properties rather than conquering them. Meanwhile the US state sends one military expedition after another to Africa. I lived in a genuinely oppressive, authoritarian Middle East country for six years, so I kind of know that authoritarianism isn’t binary, but is relative. The US is not yet close to the extreme of oppressive authoritarianism. Neither is 21st century China. 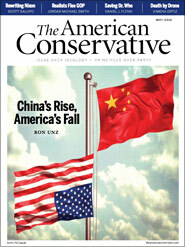 The US is worse than China in a number of ways, mostly in ways related to taxation and foreign affairs. China, on the other hand, is less respectful of the rights enshrined in the 1st Amendment and has a particularly bad track record with respect to the Tibetans and the Uyghurs. As for corruption, well, I’d just say that US political elites are more sophisticated. How is it that former NJ governor, former US senator, and top Obama campaign fund bundler Jon Corzine steals over a billion dollars from his customers and walks as a free man? Almost the only direct criticism of my article and its analysis appeared on an anti-litigation website, run by the neoconservative Manhattan Institute and presumably funded by corporate business interests including the pharmaceutical industry. Adjunct Fellow Ted Frank briefly claims that later research proved that Vioxx produced almost no negative effects on American health and that in fact “Merck’s experience with Vioxx is certainly a damning indictment of the American justice system, but for reasons opposite than the ones Unz thinks.” Presumably, therefore, the large shifts in the American mortality rate—which coincided exactly in time, age cohort, and medical cause with the introduction and later withdrawal of Vioxx—were purely coincidental. It should be noted that Mr. Frank appears to have absolutely no scientific or medical background, and is instead a lawyer by profession, with extensive political and journalistic experience. I suspect that during the late 1980s Pravda could have benefitted from his argumentative skills in explaining away the sharp rise of cancer deaths occuring in the vicinity of Chernobyl. Yet will any of these arguments make a difference? TAC has a tiny print circulation, and even the largest of the other website outlets which have now distributed the information probably have regular daily article readerships in the tens of thousands at most, while the mainstream media of American television and radio reaches tens of millions and is almost completely silent about these matters. Perhaps not. But the inherent nature of the Internet does tend to level the playing field of information distribution channels, and over time, public awareness may gradually rise. Consider, for example, my Hispanic Crime article of a couple of years ago, also published in TAC and also discussed and analyzed—often with very sharp disagreement—on a variety of relatively small circulation political websites, with no mention whatsoever in the mainstream or electronic media. In prior eras, such a piece, lacking any organized publicity campaign or prominent public advocate, would probably have vanished without a trace, leaving almost no impact whatsoever on the policy debate. Yet today, when I google the simple phrases “Latino Crime” or “Hispanic Crime”, my article comes up #2 in the rankings out of the more than 100M combined search results, with other articles discussing my analysis also appearing in the top 10. Therefore, I would think that the vast majority of journalists or researchers investigating the topic soon encounter my analysis, and it may play a role in shaping their thinking. The analytical weightings used by Google and the other major search engines are complex and time-dependent, being extremely variable for recent items, so estimating the likely long-term impact of my current China/America package is quite difficult. However, a quick Google test currently places my article at #2 of 314M results for the phrase “China America Rise” and also #2 of 408M results for “China America Fall”, with fully 6 of the top 10 results of the latter being copies or discussions of my piece. Even more remarkably, the basic phrase “America Fall” currently returns my piece at #4 of 1.6 billion results found by Google. So perhaps my arguments may eventually even penetrate some small portions of the television-addled American public. Whether that might happen soon enough to help avert a cataclysmic “America Fall” seems a very different question. P.S. It was recently suggested to me that I make my columns and articles more conveniently available to a wider Internet audience, so I have now established a personal website http://www.ronunz.org/ for this purpose. It includes as many of my various published and unpublished writings as I have been able to locate. As discussed in the Permissions/FAQ section, any of my recent writings may be freely distributed (with attribution) on any other websites. This entry was posted in UnzColumn and tagged China, China/America, Vioxx. Bookmark the permalink. Pingback: Obamacide Of American Nation Warned to Accelerate | The Rapture Is Imminent! Pingback: Asymptosis » I Heart Sane Conservatives!